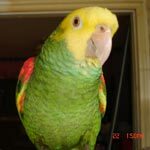 Parrot Forum • View topic - What can you teach a baby tiel ? My baby tiel is less then three months old and i was thinking that i can start teaching him after he is fully weaned till i watched a video of michael saying that you can only train parrots that are one year old and up and that you should teach a baby parrot good behaviour only. So my question is what he is meaning whit teaching him good behaviour and if it includes things like clicker training and taming so you can grab and flip your parrot on its back or does he mean whit good behaviour that you make the baby get used to you only and that he wont be afraid of you and your family. My baby tiel recognizes me and when i open the cage it flies to me directly, mostly on my head, aswell he is uses to take treats from my hand he never bites me and i can pet his head whit my finger whitout getting him stressed, so what do you think and thanks for all your replies! Re: What can you teach a baby tiel ? I agree 100% with Michael that you should not formally train a baby. It's too stressful to them and it will backfire on the trainer. You sound young so you might not remember this but some years ago there was this fad of teaching babies new words and concepts with flash cards. These babies grew into toddlers that were hugely more advanced than children that were just allowed to play and run around... I mean, it seemed they had all turned into little geniuses BUT by the time all of them were two years old, the 'just play around' kids had caught up to the 'genius' babies and, as they kept on growing, they realized that the 'just play around' kids were much better at social skills, team work and problem solving than the 'geniuses'. They were just as smart but much better adjusted than the geniuses. I think i had some missunderstanding there, you know I owned a fully grown Indian ring neck before and I had some difficulties training him ( I postet it in this forum as well) and what happened is that one day when I was outside she managed to open her cage and fly away and I got shocked because although I knew that they are very smart birds it never came in my mind that she could open the cage door mechanism, so I was pretty sad after my loss and stayed a couple years without any bird so recently when I decided to get me a bird again I was thinking that when I get a baby bird it's going to be lot easier to bond whit him and train him and as far as the bonding goes I think we doing a good job since it likes to fly to me wherever I go and eat treats from my hand, it don't likes me grabbing him but I can pet his head whit my finger and he closes his eyes out of joy but as you and Micheal informed me now I think I have to have some patience concerning his training and that's no problem for me. What I would like to know as well is what I have to expect after the bird reaches puberty and if his behaviour to me will change? As well I would like to get a IRN again after a while so when I leave the house the birds can keep company through their cages and won't get too bored, but I'm still not sure if it's better to get a baby or get a full grown since they are wild birds and Taming them is a bit difficult so what do you think and thanks for taking time to reply! They are not wild. They are scared. You can teach a baby Tiel words. Step up, food and etcetera. A parrot changes personality with his first hormonal. They are not the same birds at that time. I suggest older birds. Read the thread with Navre. He is volunteering at a rescue. He falls in love with every bird and tells us their personalities. That is the advantage of a rescue. You can also go on www.rescueme.com . They are people who can't keep their birds but can tell you their personalities, likes and dislikes. I was lucky that Rainbow and Myrtle get lovey when they are hormonal. I have read some horror stories in here. Lizs, I think that by 'wild' the OP means undomesticated - which they are. Now, you say you had problems training an IRN before and that's why you wanted to start early with the cockatiel but, my dear, you are talking about two aviary species and they are different from companion species. Michael's birds are not only companion species, they are both poicephalus known for their smarts and deep attachment to people. You can't compare a cockatiel to a senegal - it's apples to oranges. You can train a cockatiel or an IRN -sheesh! you can train a cockroach for that matter!- but it will be VERY hard on the bird because they are more flock than mate oriented and will never bond as deep with a human as a companion species. It's not a matter of being a good trainer, it's a matter of the way nature made them. Companion species that are deeply bonded to their human will want to please the human as much as they will want the reward for a trick well done but aviary species will ONLY do it for the reward and that means making the bird hungry so it obeys - a VERY cold-hearted thing to do and something no bird lover will ever consider! So, if what you want is a bird that loves you deeply and learns to do things easily, you need a companion species and not an aviary one. Pajarita wrote: Lizs, I think that by 'wild' the OP means undomesticated - which they are. Well, the problem is with the word 'companion' and what meaning it's given because, for example, to me, personally, ALL animals are good companions in the sense that their being in my house, living with me, is good company. I don't need an animal to bond deeply to me for it to be 'good company' - I enjoy watching them and knowing that i am giving them a good life. So, in that respect and in my personal opinion, cockatiels are excellent companions because they are easy to care for, beautiful, smart, quiet and have the sweetest temperaments of all parrots and whether the bird loves me and only me or not makes me no never mind. Sheesh, I think that canaries are great companions even though they couldn't care less about me because just looking at them and hearing their song makes me happy [as I am typing, I can hear two of my males singing from their room]. But, when you talk about pet parrots and bonding to their humans, you need not only a companion species but one that is imprinted to humans and, normally, small species are not handfed by their breeders but parent-raised so there is no imprinting to humans. AND, when the species is aviary, even when you handfeed, you still don't get the same kind of bonding. Now, this doesn't mean that parent-raised birds of aviary species cannot trust and love you, mind you! If you are patient and loving and do not ask for more than they can give you, aviary species can have an excellent relationship with humans... it's only that they are never really happy just with a human, they need the company of other birds of their own species for that. If you read Liz's updates on her tiels, you will understand what I mean. All her birds are rescues, some of them are handicapped and some were severely neglected but they now have a little flock and have learned to trust her and even love her. So, yes, cockatiels can be excellent companions if you don't expect them to act like a companion species. As to which are aviary and which are companion species, all the little ones like budgies, cockatiels, parrotlets, lovebirds, beebees, etc are aviary and the medium to large species are all companion but there are some little ones that are companion, like GCCs and quakers, for example. GCCs are SUPER clingy and VERY smart BUT you need to make sure you have the hours they require because they are like cockatoos in that sense, they need A LOT of one-on-one attention. As to quakers... well, what can I tell you? I love them to pieces! They are beautiful, super smart [females are GREAT talkers] and incredibly affectionate - they are one of my favorite species of parrots but I am biased. The thing with quakers is that you can't mess around with the solar schedule at all because they are not tropical. My thread is Rainbow, Myrtle & Cockatiels. Though my Amazons are with me the most, my joy is with my cockatiels. I took some time for me to reply because all the useful information you gave required me to think about it and make my own researches and thanks to you two i understand a lot of things better than before and specially after reading Liz's thread about her tiels i decieded to keep my baby and get him a mate after his first molt (because then im going to know its gender) I'm really attached to him since I handfed him since he was three weaks old ( I used to breed lovebirds and know how to handfeed chicks ) and like you its not necessary for me that every bird in my household has a strong binding whit me and i enjoy taking care of my birds and just watching them doing what they do and specially cockatiels are very funny companions but i still wish to get one bird at least that's going to be my mate and strongly binds to me what that bird is going to be i dont know yet i already got interested in quaker parrots but i dont want to rush things and doing some research before deciding and i definatly will let the forum know so special thanks to Liz and Pajarita for helping me out ! Erfan, you are a TRUE bird lover! Triple kudos to you for keeping the baby and getting him a mate!!! Now, a word of caution about quakers: people often complain that they are too loud and it is true that they do have loud vocalizations BUT, in my personal experience, they don't really scream often unless they are not happy. My Keku doesn't even vocalize at dawn or dusk, she talks and whistles instead [she is a GREAT talker -if you are interested in one that talks, make sure you get a female because they are much better talkers than males]. Please come back every now and then to let us know how things are going. We would love to hear from you and your birds.